Renault India had promised that they would deliver five cars to the Indian customer by the end of this year and with the Scala that number is now complete. Scala, which means ladder, is being marketed by Renault with the tag line of step up. So does it have the goods to encourage an Indian customer to buy it? To begin with, it's a rebadged Nissan Sunny. And just like with the Nissan Micra to the Renault Pulse transformation, the Scala is a premium Sunny. And again just like the Pulse, Renault have given the Scala a more edgier design. The front fascia is where the major, if not the only transformation that has taken place. The Renault badge resting on the gaping mouth which incorporates the front grille and air dam give the car a more aggressive stance as compared to its Japanese sibling. The headlamps, slightly stretched version of the ones on the Pulse adds to the stylish look. From the side, the car is exactly the same as the Sunny except for the new alloys. The rear has minor changes incorporated into it, like the chrome strip connecting the tail lamps and the blacked out area in the fender. But with these minor tweaks, Renault have managed to bring out a product which is superior in exterior styling as compared to the Sunny. The interiors are exactly like the Sunny with the oval centre console being the standout element. But the interiors have a very spartan feel to it, a la Toyota Etios, the profuse use of grey not helping its cause. Considering that this will be offered as a premium option to the Sunny, Renault should have considered a little more bling. 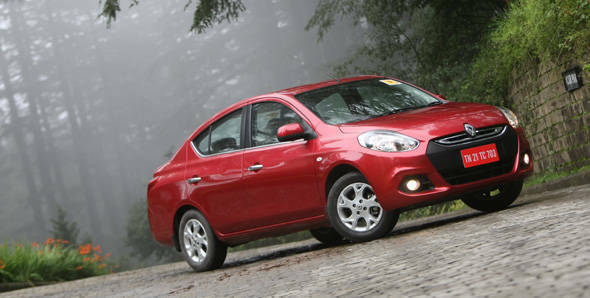 The Scala comes with both petrol and diesel options with three model variants. The diesel will only be offered in the top two variants. Renault will also bring in an automatic petrol variant. We got the diesel car for the drive with the 1.5-litre K9K engine that produces 86PS and 200Nm. The numbers are sufficient for the highway but when we were climbing up the hills, regular downshifts were needed. The turbo lag below 2000rpm becomes an issue when you are going up a slope, especially when the car has four people in it, like it did in our case. Keeping the engine in its powerband becomes mandatory in a situation like this. The ride quality is quite good. The Scala soaks up the bumps and holes that the roads have to offer. But the slightly soft suspension hasn't affected the handling of the car. It tackles corners efficiently with minimum body roll. You can really push the car and it will obey your commands. If only it had more low end grunt. The steering is not as light as the Sunny and gives better feedback. In terms of features, the top-end diesel model RXZ, offers keyless ignition, keyless door entry (driver and front passenger), climate control and leather seats. For safety, it offers dual airbags. On the whole, the Renault Scala is an attractive car, more on the outside than on the inside and will appeal to those looking for alternatives to the usual suspects. Renault's and, for that matter Nissan's bane in India, is their lack of dealerships and service centres. "The Scala will enter a segment which has an expected growth rate of 45 per cent," said Marc Nassif, MD, Renault India while presenting the product. The Scala has the goods to compete in this segment if Renault proportionately increase their reach.